While I am certain this well be the strangest thing you have ever heard, I feel there is something you must know. Ten years ago, I received one of your boxes at a hospital in Oklahoma where I said goodbye to my first son. I had no idea at the time what that box would come to mean to me. Without much thought, I stored in it photos, hospital bracelets, sympathy cards, and grief paraphernalia provided by the hospital. It spent much of the first year in the top of my closet...it was just too painful to look at. Over the years, it slowly became my go-to place when I needed to remember. You see, I didn't have a funeral for my son. His condition was so rare that I did the only thing I thought could someday make my pain worthwhile. I donated his body so that, one day, another mother may be spared from a loss like mine. I didn't order a headstone, purchase a plot, or even plant a tree. I did name a star in his honor, but it just didn't bring me the closeness that I felt with my box. That box has seen a lot in the last 10 years. It is no longer the perfectly painted masterpiece you once created. It is tattered and worn. There are bumps and blemishes where countless tears have been absorbed. The edges lack paint from all the times it hit the floor after I fell asleep safe with its precious memories. Yet, to me, it's beauty remains unmatched. It has stood quietly by as I have given birth to healthy twin boys and a perfect little girl. It helped me connect with my stepson in a way that could never have been achieved in any other fashion. Today marks 10 years since my son was born. I have seen many dark and looming Mays. This year I vowed to make May different. To spend it doing all of the things I would do if I was given the time to spend with Cameron. I thought I had it under control. Until the other night. As I was cleaning and organizing the closet, I decided to open the box. I knew better. I knew how it would end. And, just as I expected, I ended up curled up in tears holding my trusty box. I read through the cards, looked at the photos, and sobbed. Then I opened a small folded piece of paper that I hadn't noticed before. It was sandwiched between the cards the hospital puts on your door to alert the nurses that your baby has died. It was the card that came with the box. Inside it, a thoughtful poem and the names of the contributors. Yours jumped out at me as if it was in lights. I needed to tell you thank you. While you were, no doubt, going on with life never giving my box another moments thought, your gift was the one thing holding me together. It saw me through my grief. It listened to my cries. It helped me through my fears of trying again, and watched me grow into the parent I have become. That simple painted box was the closest I would come to ever holding my child. I owe to you a debt I can never repay. Your kindness means more to me that I could ever express with mere words. Thank you for sending me hope when I had none. For helping me, a stranger, heal. Please know that your art has not gone unappreciated. And while it is not quite the beauty you once sent to me, that tattered box is my most treasured possession. We had a baby born at the UVA hospital in Charlottesville, VA with a congenital heart defect in 2011. Unfortunately her open heart surgery was unable to repair the heart and she only lived 11 days. We were the receipient of a beautiful memory box to take home with the few things we had from our hospital stay. My 8 year old daughter has enjoyed looking through the box to help her remember her little baby sister. In 2012 we attended a special Memorial service held at the hospital and received another beautifully painted memory box to take home with us that day. It was another welcome treasure. We were hoping that you would be able to pass along this thank you to the wonderful ladies who donated their time and talent to provide us with our cherished memory boxes. The slips of paper in our boxes had the following names: Brenda Hockman and Mary Ladge or Jadge (not sure of the spelling). I don't even know how to start so bear with me as I tell my story. My dear friend Bobbie has a son, matthew, and daughter in law, lisa, that live in bonners ferry, I'd. They r 32 weeks pregnant. Lisa has struggled with back pain and disc problems. Sunday she was in so much pain they transferred her to sacred heart and had to perform back surgery. They used a spinal so as to not harm the baby. Everything went well and baby was fine. This morning the baby died in womb because the cord was wrapped around both feet and twisted through his legs. We stayed, prayed and tried to support the family as best we could. They put us in the special waiting room called the angel room and I was able to see first hand how the memory box is a tender and healing gift during a heartbreaking event. They place the box in the bassinet and take it along with blue or pink hand crafted clothes donated by people in memory of their loved ones. When I walked into the room I saw the box and recognized it right away. It was yours Joyce. It was the bear sitting in the field with his flower halo. Your box was given to Carter Allen and his parents Matthew and Lisa. Lisa wants you to know how much she appreciate the box and us as a group. Thanks for allowing me to be part of it. "Thank you to the artists who in their unique caring way acknowledge the brief life of a dear infant born to loving parents. You help ease their grief. 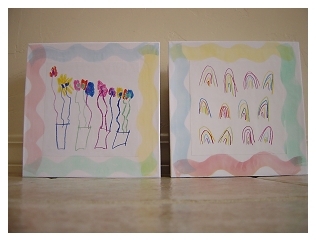 Rainbow Babies and Children's Hospital"
I recently a shipment of boxes last week that are beautiful! We do so appreciate your compassion and talent. I have Joann Ritchie as the coordinator of the Evergreen MB Artists of Eastern Washington state. My staff nurses helped me put them into safe storage in my office and they were very touched. My name is John French , I am sadly the owner of one of your memory boxes . My daughter Kinley passed away on Dec 2 nd 2010 . Your box was given to my Fiancé Michelle and I the night of Kinleys passing . The box we posses is a gorgeous heart beautifully decorated and clearly made with love . I can not thank you enough for such a wonderful program . We keep Kinleys momentous in the box and look at it daily . It is proudly displayed on the book shelf in our bedroom . What you all do really matters !!!!!! Thank you so very much for the 24 infant memory boxes. Each one of them is so sweetly and thoughtfully painted. The day I received them , one of our nurses in the NICU informed me of a bereavement situation that would be happening within the afternoon. He said "his" baby was partial to pink and butterflies. Wouldn't you know...because there are angels like you, this family received a memory box symbolizing their little girl so wonderfully. To all who supply, paint and ship your lovely artwork to hospitals......Thank You So Very Much. I coordinate the perinatla loss program here at Moutn Clemens Regional Medical Center in Mt. Clemens, Michigan and this thank you comes from myself, our nursing staff and our patients. These boxes are provided to families who have lost an infant (of any age or gestation). They may use it as they wish. We suggest that they place any items they choose in the box to remember the baby lost too soon. We provide footprints, ID bracelets, any blankets, clothing, hats, booties, etc that were used with their babies. We also provide tape measures used to measure baby's length, photos and a lock of hair if the parents consentm and a small gold baby ring from the birthing center. We also provide a soft teddy bear so that our parents don't have to leave the hospital with empty arms. So for those who have questions, I hope this provides the information you desire. During the time of loss, so much happens to these families and any small bit of comfort we provide is much appreciated. So for all the hard work, talent and caring you provide, once again a huge THANK YOU. On behalf of all the families at Riddle Hospital who have experienced a loss through miscarriage, stillbirth, ectopic pregnancy, or fetal death, I would like to say a heart felt "Thank You" for the beautiful memory Boxes that you have provided. This last set of boxes were especially beautiful and unique, they portrayed warmth and uniqueness. This is carol clevenger from Summa City Hospital in Akron, Ohio - I just received 2 bags of boxes from the Western Reserve Group and would like to thank them so much for bringing them to me - they were absolutely perfect and we appreciate them so much. Thank you for your program and all you do!! I also received a very nice thank you note from the Methodist Dallas Medical Center from a Deborah Ernst, RN. The memories we give our families become the positive treasures they hold on to in the tragedy and while they grieve and heal. Thank you again." The treasure box she is speaking of is a little box that I bought at Michael's or Hobby Lobby. The box measures 1.5 X 2.5" and I glued a pretty ribbon around the top with a bow. Here is the message I put on top of the box. "The Treasure Box" This tiny little box holds a treasure beyond compare. Just a tiny lock of my sweet baby's hair. I hope you enjoyed the note I received, it simply made my day when it came in the mail. will be so appreciative of these thoughtful gifts at such a difficult time. Thank you and your volunteers so much for your time and effort. Hello, this message is for Ginger German who created the lovely memory box for my family. I just wanted to express my gratitude for this memory box. Our little boy, Brian, died an hour after his birth last Tuesday, April 5. This box is a wonderful place to keep the items we have to remember him by  an outfit he wore, pictures, and other items. We had a small service for Brian yesterday at All Souls cemetery near our home in Pennsylvania. He will rest in the baby section. We know that he will be with us always as our guardian angel. Thanks again, so much, for what you did for us. God bless you and your organization. heavenly birthday. Before leaving the hospital last year I was given a beautiful memory box with the sweetest little lamb painted on it. I didn't have a lot to put in to it to remember my daughter at the time, but as the year went by I have collected things that reminded me of her. Tonight I took it from the shelf and was going through her things and came across the name Ann Mohrman, on the inside of the lid. I want to send a big thank you to your organization and to Ann. I know a lot of love went into making this memory box and it sure has meant the world to me. Thank you for what you do! generous donation of boxes. Our patients will be very appreciative of them! I wanted to send a note to let you know that we received the shipment of memory boxes. You will never know how much your thoughtfulness is appreciated by our patients and their families. These beautiful hand painted boxes, often bring a smile to the face of a devastated mother and father. During this time of grief, it is so nice to be able to offer them something so special to always remind them of their precious baby. It is very touching to know that others, like you are so involved and caring about the need of these patients. Again, thank you for your dedication and kindness. Please also express our gratitude to the team of volunteers who assisted. Thank-you for the beautiful boxes. We will fill each box with memories including footprints, handprints, a lock of hair, a blessing card and such. Please know that the boxes that you created will be forever treasured by moms who lost their babies. The butterfly design is my favorite! We use a butterfly as a symbol of pregnancy or infant loss at our facility- placing a butterfly on the patient door and chart reminds staff members and physicians that may enter the room of the families loss. Thanks for sharing your talent and time to make a difference to grieving hearts. The NICU just received its first shipment of memory boxes and all I can say is... WOW!!! They are all absolutely beautiful!!! It's obvious the artists take great pride in what they do. I am completely satisfied with the response time in answering our requests and look forward to more beautiful memory boxes!!! Thanks again from henry Ford Hospital in Detroit, MI. Dianna Leun at Erlanger Hospital in Chattanooga, TN. that went into each box." On behalf of our "With Empty Arms" Program here at Tacoma General Hospital, I am writing to thank you for the beautiful memory boxes you so generously donated to our program. I am honored to be the person to give the families a hand painted memory box. 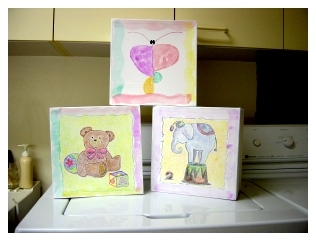 Families are able to keep their precious baby's belongings in a beautiful box that was painted with love. This is such an important way for families to receive support and help them in their grief journey. These boxes give families the opportunity to keep their baby's belongings in one place and they can display it in their home. When family and friends see the hand painted memory box it allows an opportunity for conversation that is healing rather than trying to say something that may end up being hurtful. Thank you for your generosity, time, and most of all love of others. May God bless you all for being silently there and giving so much without asking for anything in return. I recently received three different shipments of beautiful memory boxes. One of the boxes contained an unidentifiable return address and I am unable to send that individual a thank you letter. I have no talent in artistic crafts and can only imagine the hard effort put into each box. HOW QUICKLY YOU RESPOND!!! Thank you. We received 9 boxes this afternoon. How grateful we are to you all. Weve sent a thank you card to the Black Hills Decorative Artists. I have just received several memory boxes from the organization. I saw Joyce Carlson's name in one of the boxes and I saw another name on the return address label (I think it was Ellerton?--sorry). The boxes are absolutely beautiful! I can see a lot of time and effort went into them. We truly appreciate all the members of the memory box organization. Both Marsha and I wish to thank you for the handpainted boxes for our grief program. I am so happy that we were able to connect with your program. Thank you so much for the memory boxes your group provides for us. I cannot tell you how appreciative we are to have access to your beautiful work. Our families tell us all the time how much it means to them to have such a lovely keepsake. We feel so responsible for trying to help just a little to soothe the ache our families feel and you are such an integral and important part of our ability to do so. Thank you so very much for your beautiful gift of time, talent, & creativity displayed in your memory boxes. Myself & the nursing staff at Lankenau Hospital are very grateful & appreciative to receive these boxes and have them as part of our bereavement program. Our parents are thankful to have these boxes to store their precious & only memories of their baby. The gift you give is very special. Thank you for all you do. I just received a shipment of memory boxes and I just wanted to thank you ,also, for your work with this program. The boxes are always so special and beautiful, each one unique. Thank you for all you do for families you will never meet. Thank you so much for the beautifully painted memory boxes for our bereavement program. Our patients love them and make so many positive comments about them. You guys truly are angels and we appreciate all that you do. the beautiful handmade memory boxes. be given something so personal, is very much appreciated. Once again, thank you for thinking of Children's Hospital for your gifts. I am in receipt of the 12 memory boxes for our Infant Bereavement Program. The Maternal Child Health Services (OB/GYN and Pediatrics) at WoodhullMedical & Mental Health Center are grateful for the beautiful memory boxesby the creative artists of Sea Strokes of Maine Decorative Painters. We alsohope that the memories kept in the box will bring some comfort to ourgrieving families. On behalf of Woodhull's Bereavement Program staff, thank you very much. On behalf of Pinnacle Health Perinatal Bereavement Services, our perinatal bereavement counselors, and our nursing staff, I want to express gratitude and appreciation to Penns Woods Painters for providing the lovely memory boxes that have provided comfort to our bereaved families having pregnancy losses including stillbirths and newborn deaths. Your generosity has enabled our staff to give the beautiful hand-decorated boxes to parents to help them collect and establish memories of their precious babies, at a time when saying “hello” and “good-bye” is so very, very short. The parents fill their memory boxes with their babies’ footprints cards, pictures, ultrasound photos, clothing, blankets, poems, and toys—anything that provides tangible memories of their babies. The staff is supported by being able to offer the parents a beautiful memento that provides comfort to them. Some parents have related to me that their memory box has been placed on a shelf dedicated to their baby, along with framed photographs, a baby blanket, and the urn holding their baby’s ashes. One parent has told me how important and significant the gift of the memory box was to them and how it touched them that strangers would reach out to provide comfort to them at the time of their loss. Another parent was so affected by the meaning of the gift of the memory box that she and her family have made and donated baby blankets to help others create memories of their babies—mementos that bereaved families can place in their memory box just as they did. Many patients have chosen to place the ashes of their babies contained in a soft cloth and lace envelope in the memory box they received when their baby was born. Several parents have also told me that they periodically open up their memory boxes and look at the mementos, especially during anniversary dates such as their due date, date of baby’s death, and holidays. Although there is sadness, there is comfort and peace in the memories of their babies. I appreciate Penns Wood Painters’ continuing to provide Pinnacle Health System with the memory boxes that helps our families with pregnancy losses begin their work of healing from their grief. My name is Sheri Lucius and I am the Perinatal Loss Coordinator at Huron Valley-Sinai Hospital in the Harris Birthing Center. I wanted to thank you for sending us the beautiful Memory Boxes that we present to our H.U.G.S. ((Help, Understanding, Grief, Support) is the name of our perinatal loss program) parents. They are always touched and honored that someone who does not even know them ‘gets it’…their baby(s) are special and loved by not just them as parents but by others who respect them as having made a difference in this world even if they only live a short time or never take a breath. We give our parents numerous mementos that they place in their boxes. From outfits, blankets, bracelets, locks of hair, castings of their baby(s) hands and feet, pictures, frames, flower seeds, ceramic hearts, scrap book pages and footprints to name a few. HUGS…………Sheri and the H.U.G.S. team. I wanted to let you know that 12 beautiful boxes arrived today in my office so I could place them in our bereavement room and finally distributed to our bereaved families. I am so grateful to your organization that these boxes arrived in such a timely manner soon after I had placed my order. It is wonderful to know that a person can follow your directions and in a short time receive their promised boxes for the bereaved families. I shared all of the beautiful designs with my secretary. My name is Elizabeth W--- and about 10 weeks ago, on May 13th, my fiance and I said goodbye to our precious, identical twin baby boys. I was 5 months pregnant and my membranes ruptured prematurely for no known reason, causing spontaneous labor. Isaac Manuel and Benjamin Michael were born alive, yet they were too premature to survive. During the short time that we had to hold them, meet them, and love them in person, they touched our lives immeasurably. It was very comforting to receive the beautiful memory box from the nurses at the hospital. Holding the lovely box helped me to see that there are people out there who understand our pain and who value our babies' lives. Thank you for helping us to honor our beloved children and embark on our healing journey. I want to express my sincere thanks for the beautiful memory boxes donated by the Evergreen Memory Box Artists of Spokane, WA. Since I do not have their contact information, I hope it is possible to pass along this "thank you" to them. We absolutely love the boxes, and they have been such a wonderful addition to what we can provide families at the loss of the child. The hard work and creativity of the artists does not go unnoticed! Each individual painted box is very much appreciated by not only me but also the staff and families. Since working in the Pediatric Intensive Care Unit I have come to realize just how important these boxes are for our families. They are perfect for holding the memory making items we have here at the hospital (hand and foot molds, memory hearts, lock of hair, etc), as well as precious items that the families want to keep in a special place. The boxes are such a wonderful gift to be able to provide families during a very difficult time. Thank you again for all of your hard work and your caring heart. We are truly fortunate to have such wonderful people who are willing to use their talents to provide a precious gift to these families. Your thoughtfulness and dedication to reaching out to others is truly heartwarming, and WE ARE GRATEFUL! On behalf of the staff and the mothers we serve at Riddle Memorial Hospital; I would like to thank you for the beautiful memory boxes that we received.Unfortunately we had the need to use one this past week . What a remarkable work of love they are. Today we received a lovely selection of beautiful tole memory boxes for our Moms experiencing perinatal loss here in the Family Childbirth Center. They are a welcome addition to our other mementos that we carefully chose and save for these parents during the difficult days surrounding the loss of a baby or pregnancy. It is a pleasure to have a work of both art and love, including the poignant letter from the memory box painter and your group enclosed in each box. Hoping that the families we will give support to through the next few years will be small, I believe we have enough memory boxes for hopefully a fair period of time. We will be sure to let you know if our supply dwindles. Please extend our deep appreciation for all members of you group who work on this project and continue to do their part to soften the losses of our little ones. My son was stillborn on April 17th, 2009. As pat of their grievance program I was given a memory box that was painted by Debbie Jones. My hope is that a copy of this will reach her as well. My family was very unprepared for this event in our life. This memory box was one of the best things my family received. It is already stuffed full with everything we could keep to remember Gabriel. It means so much to my family to know that there are people out there that care, that do not even know us. We will have the memories to last a lifetime. Thank you all so much for giving us something to keep them in. The design on the box was perfect. The letter says that it was based on a design from Pam Haucock. The little baby in the moon. It really was very comforting. Thank you. he was 23 days old. I received in the mail 6 beautiful boxes made by you. Thank-you so much on behalf of their recipients. I'm the bereavement coordinator here at the hospital and give the boxes out when patients have a loss. They mean so much to them, knowing that someone is so thoughtful. I just wanted to enclose a nice note I got from Port Huron Hospital here in Michigan. I also wanted to attach a couple of pics that show some of the boxes I create for the program. As you can see I am not a tole painter but like to include child art in my work. Lucky for me I have grand children and a daughter who was creative when she was small. All of my boxes are made from recycled materials and colored pencils and water color are my medium. The paper I cover my boxes with is acid free post product from the printing process. The mat board is mostly acid free and are scraps given to me by a wonderful frame shop. All my boxes are coated twice inside and out. I just wanted to thank you so much for the beautiful memory boxes that we received at Port Huron Hospital. They were so creative and unique. We were so pleased with the boxes. We, of course, use the boxes to give our parents who have lost a baby. They get to take the momentos that they receive at the hospital home in the box. The boxes that you sent are the perfect size. The artwork was just precious. In the past we received some boxes that were somewhat inappropriate for the occasion. They had sayings like "baby boy and baby girl" on them and this is not something that the parents want at this time. Our favorites out of your boxes were the rainbows and butterflies. Many parents have symbols that are discrete that remind them of their loss. Again, thank you so much for sending these boxes. Let me know if you will sending more. We never know when we are going to use them. Having a few more would be very helpful. We try to keep about 20 boxes on hand because it seems like these patients come in rashes unfortunately. Your artwork and your grandchildren's artwork was amazing and so much appreciated by our staff and will be by our families. Please thank everyone who contributed. You have no idea how much these families need such a beautiful item at such an aweful time. A group of artists were looking for opportunities to expand their craft when they spotted a notice about painting memory boxes for families of infants who pass away in the hospital. "When you lose a newborn and walk away from the hospital with nothing to remind you of the infant, it can be devastating," the notice stated. "B ut a small hand-painted box to hold mementos of the infant, such as the hospital I.D. bracelet, a photograph, skullcap or lock of hair, can give the parents something to cherish." That was 1999, since then some 25 members of Gateway Decorative Artists have shipped thousands of the individual memory boxes to hospitals across the country to be given to parents. The national organization that they have affiliated with has shipped more than 115,000 boxes. Until recently, Gateway painters never met the parents who received these boxes. But as word of the project grew, the number of hospitals requesting memory boxes expanded. Pacific artist Michelle Bastean was introduced to Gateway Decorative artists by Janie Parisi, her sister-in-law, who recently lost an infant grandson in childbirth. "His tiny foot was the size of my thumb," said Parisi, holding up her hand to demonstrate. "I never dreamed that our family would be the recipient of one of the boxes." Gateway artists paint together each Wednesday and hold a class once a month at Lindell Bank in St. Peters to teach other tole painters the craft of memory boxes. The artists buy the boxes, all the paints and pay for the postage to ship them to hospitals. When they teach a class, they sand and seal the boxes ahead of time and trace an outline of the pattern to be painted. Between them, they have introduced 60 personal designs of flowers, teddy bears, hearts and angels to the boxes they have distributed through the National Memory Box Association. "They tell us which hospital needs boxes and how many they want," said Gloria Falk. Gateway Artists can complete up to 36 boxes during a monthly class, but when they work in their own workroom, they can paint as many as 60 boxes in one day. Currently, they are top U.S. producers of the boxes three quarters of the year - outdone in one quarter only by the Black Hills Chapter, which in a South Dakota winter can top the local group's 250 boxes. Gateway artists also use their talent to raise funds for the Turning Point Women's Shelter in Warrenton and the Riverbend Animal Shelter in Jerseyville, Ill.
"It's a labor of love," Falk said. "Every box that we paint is a child lost." In addition to shipping through the national memory box program, Gateway artists distribute directly to several area hospitals including St. John's Mercy in Washington. How thoughtful, considerate & beautiful is your artistic skill & work on the memory boxes - so creative is your gift. The boxes are admired, yet so much appreciated. We had a special guest, Kristyne, at the meeting who touched our hearts as she told us of the loss of her daughter when she was only 6 months pregnant and the feelings that she had when she recieved one of our Memory Boxes. She opened her box, which had been created by Rho, and explained each of the items that she keeps there. These included photos, a knitted blanket with matching knitted rose buds, the tiny dress & hat that her daughter wore in the hospital, CDs with more photos taken by the hospital of her daughter, ID bracelets, a special booklet which contains the tiniest footprints & handprint I have ever seen, and many more items which she treasures and will keep forever in her special Memory Box. Kristyne bought treats for all as a Thank You for painting Memory Boxes. She came to our meeting so she could learn how to paint a Memory Box for another Mother who would experience a loss at birth. She quickly learned how to paint the outside of this box, applied a Wallie, and will come to the next meeting to finish the inside of the box and varnish it. In the meantime, she will show the Memory Box she painted to her family & friends, which will help spread the word of this wonderful program and possibly gain a few more volunteers. Needless to say ... we were all in tears at the meeting as she carefully lifted each item from her daughter's Memory Box. It has prompted all of our members to create more MBs during the coming months ... and I hope it will renew each of you who reads this. I just received several wonderful memory boxes and I wanted to thank you all so much. They are beautiful and perfect for our program. The artist was Karen Strubel. If you can get a message to her, please thank her and let her know how much we appreciate her sensitivity, time, creativity and generous spirit. Our mom's will keep these boxes forever and it is such a beautiful way to hold their babies memories. On behalf of our "With Empty Arms" program here at Tacoma General Hospital, I am writing to thank you for the beautifully hand painted memory boxes you so generously provided for us. These memory boxes will be such a comfort to families as they contain their infants memories. On behalf of the bereaved families who will receive these memory boxes, I extend to you sincere appreciation for your compassionate gifts. Please be assured that the memory boxes will be well cared for, and selectively given as each special need arises. Thank you for participating in this project, and may your heart be warmed just knowing your efforts are making a meaningful difference. It is through the generous donations from individuals like yourself that our families receive comfort as they begin their grief journey. Also, thanks for sending them so quickly. I want to thank you for the quick response to our request for more memory boxes for our bereavement program. We used five so quickly and had only one cute pink heart box left. But Judy did send us three beautiful ones and today another box arrived stuffed full of pearly colored ones. Now our cabinet that stores them all locked safe is full and I hope it is many months before we need more. Our families have expressed appreciation for such unique boxes to store their baby mementos in. Pass our appreciation on to all the painters and angels who help create these special boxes from our nurses and the grieving families. Hope your sunny spring is as beautiful there in the west as it is in Arkansas. You are in our thoughts. Thank you so much for the lovely memory boxes that you made for our hospital. The painting is beautiful that you did. We appreciate the different sizes as people are very different as to what they would like. I find it best to bring them to the office to pick one. Usually there is one that they "love" for a special reason. It is wonderful to see them connect in that way to what someone unknown has made for them. Thank you for your kindness. Thank you very much for the memory boxes that you sent to Salina Regional Health Center. They are beautiful! The love and detail in their making is obvious. We appreciate you wanting to reach out to the families in our area that have had a baby die. Please thank the people that made them for us. I know our families will cherish their memory box. Earlier this week I had a patient who lost a baby and was given a memory box by one of our nurses. She has already lost two other babies in previous years. When I went to visit her after the baby died she told me it was the first time someone had given her such a precious gift. She said, as she clutched the box to her heart, that holding the box filled with her baby's keepsakes was like holding her baby. Thought I would pass this along for you to share with Gerry and the others. My husband and I received a Memory Box created by you from the nurses and Unit 51 of the Foothills Hospital. We just wanted to share with you a little about the memories we'll treasure in it. Our baby girl, Mandy Elizabeth, was born and died on May 4, 2001. Our tiny angel was afflicted with severe cystic hygroma as well as Turner's Syndrome. She was 21 weeks gestation when I delivered her and was stillborn. We got to hold her right away. She weighed a little over a pound and was 9 inches long, so fragile and so innocent. Later the nurse brought her back to us and gave us the Memory Box containing a little outfit they had put on her to take pictures, the roll of film and some booties. There were also a few Polaroid shots and her hospital bracelet. We hadn't thought about any of these things ahead of time, the pictures, a blanket... The Memory Box and its contents are something we will always treasure. It and our love are all we have to remember our baby girl and we want to thank you for providing grieving parents with such a gift. In Mandy's memory, we plan to contribute something similar because it has meant so much to us, it's important for other parents to have something as well. Thank you. On behalf of the Patient and Family Resources Department at the University of Florida, we sincerely thank you for your thoughtful donation of two memory boxes to families who have experienced the death of a baby here at Shands. The memory boxes are so beautiful, personal, and touching. This is a special way for family members to remember and, show that others care about their healing from their loss. We are proud you are part of this program. Thank you! Once again, thank you for your generosity and thoughtfulness to the families here at Shands. Today I received the six memory boxes you created. Thank you. Words will never express adequately how meaningful these boxes are to families. Perhaps it comes to focus when you reflect that in this lovely box are all that this baby has ever had or will ever have...but what surrounds the box is the love and affection shared by you and by his parents. Thank you. Please accept our heartfelt, but belated, Thanks for the beautiful memory box for Jacob. We are so touched and grateful! The box is so beautiful - and it holds some of our most precious mementos of Jacob ... his little stuffed Tigger, the outfit he wore, his ID bands from the hospital - all the little things we need to go back and touch when we want to be close to him. ..... May God bless you for all the love and comfort you are giving to parents suffering the loss of a child. The loss of a loved one brings us to our knees. The journey of grief is made more difficult by American society's denial and lack of understanding of this journey that we all must take some time in our lives. Those of us working with bereaved families are constantly amazed at the gifts we receive from the grieving families and those who support the work we do. It is truly amazing grace, manifested in our daily lives. All of you who support our work and all of the families who share this most difficult journey remind us of our humanity and thereby make us more compassionate, remind us of our mortality and thereby make us grateful for each of the moments in our days and the loved ones in our lives, show us courage and inspire us to stretch beyond our ordinary vision. We feel honored to have people like you dedicated to the important work that we do. I will mail the card on Monday. We are planning a memorial garden for our families. When it is planted, we will have a dedication ceremony. We will be inviting all of the people who have supported our perinatal loss program, as well as the bereaved families. I will keep you posted. It is an important thing that you do...involving the girl scouts. It shares the compassionate side of grief that insists that we grow and learn and teaches us that even in sorrow there is love, life and hope. Maybe your girl scouts will be less afraid of death through their gentle exposure through you work. Blessings to all of you and again our deepest thanks. This is just a sampling of the hundreds and hundreds of letters received by the program and it's recipients but it gives an idea of the impact the program has had.